Just as in human development, puppy development follows a very predictable sequence of step, although there is no widespread agreement on the exact ages that these milestones occur. Small dogs grow and develop quickly and often reach maturity before larger breeds. 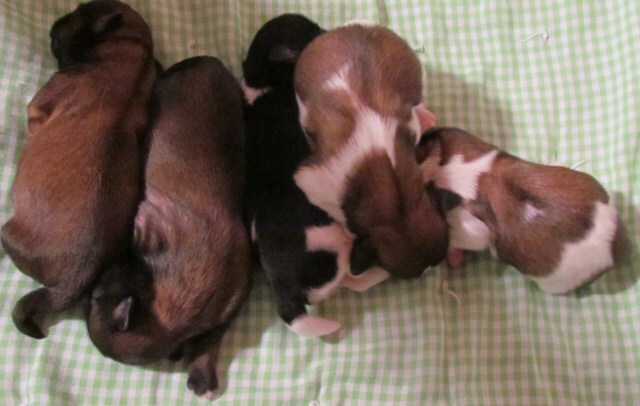 Puppy development follows a predicable path yet each puppy is unique and each breed is slightly different at the various stages of development. The old rule of each year of a dog’s life is equivalent on seven years for human is not completely accurate. For most small dogs, the average life span is approximately 16 years. Small dogs mature early and females often have their first heat by the age of 6 or 7 months. By the age of 12 or 13 months, they are often ready to be bred. Many changes take place in the first year of life. Puppies go from a relatively helpless neonate who cannot see or hear or eliminate by himself to a fully grown, agile, sexually mature adult all in less than 12 months. When do all of these changes take place? We will first look at puppy development week by week. Cannot regulate their own body temperature. Need to keep puppy safe from venturing too far. At birth, your puppy’s eyes and ears are closed. In fact, only 3 senses are working—touch, taste, and smell and even then they are not fully developed. They can feel and respond to pain, discomfort and minor disturbances by whining or crying. Their body temperature is well below that of a mature dog, and they are unable to tolerate a cool environment. For optimal puppy development, the room temperature must be keep very warm and breeders accomplish this by maintaining room temperatures around 80 degrees and providing heating lamps and/or heating pads. Their first main mission in life is to find warmth and food. They have no teeth, but their nails are fully developed and some may even need trimming in the first week of life. Their main activity at this time is to search out nourishment from their mom and sleep. Newborn puppies sleep most of the time, often twitching in their sleep and move only to reposition their body. Twitching occurs because at this point in their young lives, they sleep is the REM stage, a stage characterized by high brain activity. Beyond that, they have little interaction with litter mates or the environment other than to huddle close to litter-mates and mom for warmth. They depend on their mother to provide the food they need and to help them potty. Mother also has the assigned task to clean up after all pottying activity, a job that mother dogs accept happily. 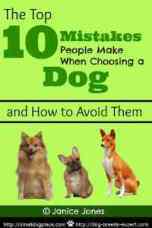 Even into adulthood dogs do not have particularly sharp vision. Once their ears open they may begin to startle when they hear sounds. Even from the very beginning, their range of hearing is nearly twice that of humans and into the ultrasonic range. At three weeks of age, puppies become somewhat adventuresome and begin to mover around more, though they are not very sure footed at this age. This might be equivalent to the crawling stage in the human infant. But progress occurs rapidly and by 3 ½ weeks most puppies are getting around well on their own four paws. Their eye sight and hearing are improving daily. This is also the time that they begin to lap liquids and mouth solid foods if the consistency is mush-like. They also begin to have limited interaction with litter mates, but the majority of this interaction revolves around who is going to serve as pillow and who is going to serve as blanket as they pile up in one small corner of the whelping box. Puppies take turns sleeping on top of the pile and cuddling underneath and don’t seem to mind either position. Three weeks is the ideal time for socialization to begin. Puppies have their eyes and ears open and are beginning to crawl around more and try standing and walking. By four weeks of age, most puppies have figured out what “real” food is and continually eat more dog food, nursing less. They are far from being weaned at this age. They are moving around more and sleeping less. This is the time where socialization to the outside world begins. Puppies should begin listening to music or TV, hear environmental sounds such as the dishwasher, hair dryer, can opener, and vacuum cleaner. It is also a good time to introduce different textures into their world. They can be given opportunities to walk on different surfaces such as wood, tile, concrete, grass, carpet and dirt. Different textures can be added to their box and puppies can snuggle up against the breeder who is wearing a variety of different textured clothes. At four weeks he is also beginning to regulate his own temperature and feel the urge to pee and poop on his own. He won’t always need Mama to stimulate him to go potty, yet most good moms continue to clean up after their pups at least for a while. If given toys at this age, he will explore but rigorous play is still in this young pup’s future. Mama will try to encourage her youngsters of this age to wean, making herself less available for free drinks at any time of the day. Puppies show first signs of “play fighting” with litter-mates, but it is too soon to determine temperaments and canine pecking orders at this time. Some moms actually regurgitate food for their young, although is not seen very much in domestic dogs. At six weeks of age, puppies are ready for their first shots and they should have already had a couple of wormings by now. The tiny breeds may not get their first shots until around the age of 8 weeks. Play takes on new dimensions and toys become fascinating objects. Puppies want to explore and will find ways explore every inch and cranny of their allotted space. During this period, breeders should continue to offer stimulation in the form of sounds, smells, and textures and provide interesting environments for puppies to explore. Mama continues to teach her puppy manners especially “bite suppression. Puppies learn what appropriate canine behavior is and is not through the use of play and observing other canine body language. These behaviors will be repeated for two weeks until they become fully weaned and ready to go to their forever home. Smaller breeds such as Yorkshire terriers, teacup toy poodles and Chihuahuas may need more time with mama and the litter mates. A puppy of 6 weeks is curious, friendly, outgoing and fully ready to learn. If socialized correctly he will be completely ready and eager to please his new human family when that time comes. At eight weeks of age, many small breed puppies are ready to go to their new home. Others will stay with their canine mother and breeder for another 4 weeks. This is especially true of the smallest of the toy breeds. At eight weeks the puppy begins to experience caution in his action. At previous stages of puppy development, he was exuberant and reckless, charging forward without any fear. During the next couple of weeks, the puppy becomes cautious and checks everything out. IT is important that new owners let nature take its course as the puppy will get through this stage and move on relatively quickly. It is also important that owners not “cuddle and baby” the puppy during this stage, but rather assure for the puppy’s safety, but not jump in to rescue them unnecessarily. Some puppies develop fear and anxiety issues if allowed to be rescued during this time that are hard to correct later on. If the puppy goes to his new home during this time, the first few nights will be tough for the little guy as he has not had too much experience being on his own. Socialization is very important during this stage of puppy development and will continue to approximately 12 weeks of age. Before a puppy arrives, your house should be ready including puppy proofed for the puppy's safety. The more new sights, sounds, smell etc. that he can experience the better. Puppies that have lots of socialization experiences and stimulus during this period will be much better equipped to handle change as they grow. This is also a great time to begin training. The first training is potty training and then simple commands. Basic obedience is best started at home and then enrollment in a formal obedience class once he is fully immunized is always a good idea. Immunizations are vital to the health of young puppies and should take priority over any attempts at socialization. For example your young puppy is not ready for a dog park until all of is immunizations have been given. The best rule of thumb that I have been able to determine is to treat a pup as if it were a newborn human infant. Anything you wouldn’t do to an infant, you shouldn’t do to a puppy. This is considered to be the puppies “tween” stage because the first signs of independence is noticeable. We call this the pre-teen stage in human development. This is a very demanding stage of puppy development and the well-behaved little guy who stuck right by your side will suddenly want to ignore you and do his own thing. Behavior is a little erratic during this period and tends to fluctuate from being a sweet cuddly baby to a stubborn tween. Teething begins in earnest and the puppy tries to find anything and everything to chew upon, whether it is a favorite wooden chair or a person’s toes. This is the time when potty training usually occurs and beginning obedience training such as how to walk on a leash, not necessarily how to heel. By the end of this period, the puppy should have received his third set of puppy shots and a Rabies vaccination. It is during this stage that the growth spurt that your little puppy has experienced since birth will begin to slow down. You may also notice a decrease in the amount of food that the small puppy consumes. One the puppy is fully vaccinated; it is a good time for you and your puppy to explore the world. He should go with you on outings whenever possible. This is also a good time to begin puppy kindergarten and teach your puppy some basic commands. Congratulations, your fur son has reached his teen years. Attitude is everything during this period. He tries to break all the rules if given the opportunity and test the limits. As long as socialization and training continue, the puppy does not grow into a juvenile delinquent. He can attend puppy classes and learn basic commands. He will lose his baby teeth and gain a full set of adult teeth. Dental care is important during this time. He or she will reach sexual maturity some time during this age and it is a good idea to have him neutered and her spayed. 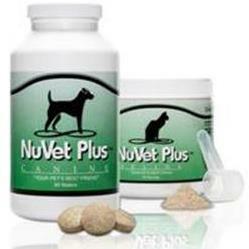 Most veterinarians recommend sometime by 6 months of age. Your puppy will need discipline, exercise and lots of chew toys. Your greatest asset during this stage is Patience! The end of this period marks the end of puppy-hood and the beginning of sexual maturity for small breeds. 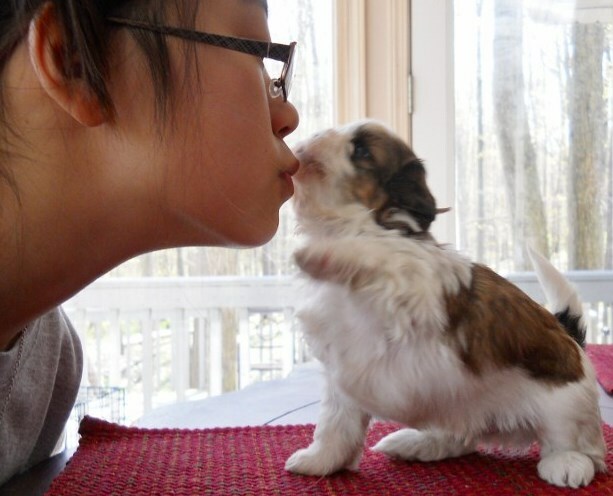 Small breeds will reach their full adult size, height and weight. If your puppy has not been neutered or spayed, expect to see outward signs of sexual maturity. Females may have gone through their first heat sometime after 6-7 months of age and by their second heat they are full ready to take on the role of motherhood. If males have not been neutered, expect some territory marking. Boys can be fathers as young as 7 months. At this point, your puppy is now an adult and can be switched to adult food. There will not be an noticeable changes in appearance right away and many small breeds tend to keep the playful puppy personality long into their senior years. Gradually, the exuberance of youth will begin to fade and if you have done your job of training and socializing your puppy, your adult dog should begin to calm down and become more predicable in habits and behavior.